Cory Stockton tweeted this afternoon an important update to the cost of pet battles: instead of the old 100g training, the price has been reduced to 10g. There has been a lot of people in the community claiming that 100g was too high a cost for the feature, and that it should be lower. Previously Blizzard has said they wanted to keep it high to stop people from thinking that it was a main part of the game, when in reality it’s a side game. They didn’t want people to get distracted from the real point — leveling up your character. While that’s not an issue for those of us that have played WoW for a long time, the whole system can seem like a gigantic thing to new folks — and one that might confuse them as to what they’re supposed to be doing. Just hotfixed the cost of Battle Pet Training to 10g. We still don’t want newbie players but 100g was obviously overshooting that goal. 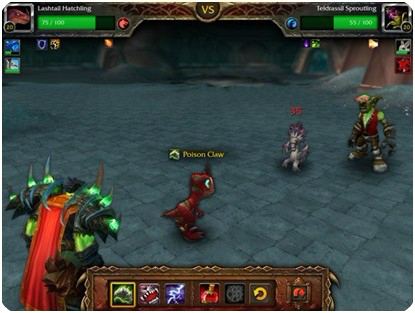 This entry was posted in World of Warcraft: Mists of Pandaria and tagged Battle Pet Training, Pet Battles, WoW by admin. Bookmark the permalink.